The White House story on Comey’s firing is falling apart. 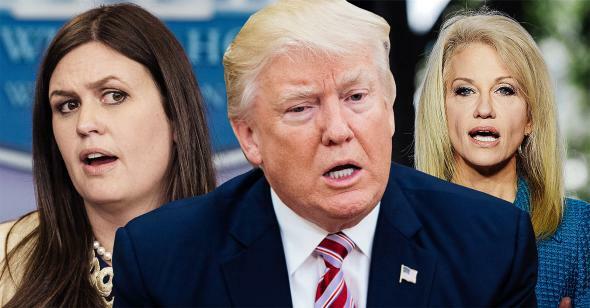 Sarah Huckabee Sanders, Donald Trump, and Kellyanne Conway. Photo illustration by Slate. Photos by Saul Loeb/AFP/Getty Images, Molly Riley-Pool/Getty Images, Alex Wong/Getty Images. Why did President Trump fire FBI Director James Comey? There is plenty of informed speculation, but we don’t know yet, and the answer will require further investigation. We do know two things: The explanations given by the White House are false, and the evidence points toward friction over the FBI’s Russia investigation. But that story is falling apart. Here’s why you should be suspicious of what the White House is saying. These reports don’t just expose the Rosenstein memo as a front. They also present a timeline that defies White House accounts. Sanders, in a Fox News interview, attributed Comey’s firing in part to his May 3 testimony before the Senate Judiciary Committee, in which Comey made some errors. (The Times account agrees that Comey’s testimony upset Trump, but for a different reason: because Comey testified that he was “slightly nauseous” at the thought that the FBI might have helped to elect Trump.) But if Trump’s push for the ouster began more than a week before Tuesday night, then it preceded Comey’s testimony. Conway and Sanders also cited, as a basis for the decision, the FBI’s formal correction of Comey’s errors. But the correction wasn’t reported until after 5:00 p.m. Tuesday, which, according to Spicer, is when Trump notified Comey and Congress of his decision. The asserted sequence—errors, correction, memo, decision—can’t be squeezed into the time frame. And if the Times is correct that Trump made his final decision “early Tuesday,” then the sequence is a lie. 4. The story doesn’t fit Trump’s prior statements. After Comey reopened the Clinton probe in October, Trump said the decision showed “guts,” restored Comey’s “reputation,” and earned Trump’s “respect.” In January, Trump asked Comey to stay on as FBI director. In a tweet posted on May 2, Trump said Comey gave Clinton “a free pass” and was “the best thing that ever happened” to her. Now the White House claims that a briefing or a memo reversed Trump’s opinion. And the spin presented by Sanders on Wednesday—that Trump had been thinking for a long time about firing Comey—doesn’t fit either account. Trump’s original complaints about Comey were about leniency toward Clinton. Rosenstein’s memo is about undue harshness toward Clinton. 5. The story doesn’t fit the speed of the firing. All of these things happened within hours on the same day: the FBI’s correction, Rosenstein’s memo, a follow-up memo from Attorney General Sessions to Trump, and Trump’s termination letter to Comey. Between these events, there was little time to consider the evidence or arguments just presented. Even if everything in Rosenstein’s memo had been presented to Trump on Monday—which would be odd, if, as Sanders says, Sessions and Rosenstein were at the White House for other business, and Comey came up as a side issue—that’s still just 24 hours from the initial briefing to the termination letter. Trump didn’t even wait until Comey, who was out of town on a recruiting trip, returned to Washington. Clearly the sequence was driven by haste, not deliberation. The White House’s story, that the briefing and the memo immediately and fully reversed Trump’s judgment of Comey, isn’t credible. Sanders’ explanation on Tuesday night for the haste—“When you make a decision like that, frankly, Tucker, why sit on it?”—is absurd on its face. It also doesn’t square with the story Sanders told Wednesday, about Trump stewing for months over Comey’s fate. And on MSNBC Wednesday morning, she was unable to explain why Trump waited 18 days to fire then–National Security Adviser Michael Flynn—who had been caught lying about his contacts with Russia—but moved in just hours to fire Comey. Feb. 24: Comey rejects requests from the administration to publicly rebut reports about Trump associates’ contacts with Russians. Shortly afterward, in a tweet, Trump blasts the FBI for failing to find people in its ranks who are leaking information about Trump associates’ contacts with Russians. “FIND NOW,” the president demands. March 4-5: Trump claims President Obama wiretapped Trump Tower. Comey asks the Justice Department to deny this. The department refuses, and Comey’s request is leaked to the press. March 20: Comey reveals that the FBI is “investigating the nature of any links between individuals associated with the Trump campaign and the Russian government,” including “whether any crimes were committed.” He also testifies that he has checked with the FBI and found no evidence for Trump’s persistent claims that Obama wiretapped him. March-April-May: According to CNN, associates of Flynn receive grand jury subpoenas, “the first sign of a significant escalation of activity in the FBI’s broader investigation.” In a May 9 report, CNN says the subpoenas were issued “in recent weeks.” In her Wednesday briefing, Sanders claimed that the White House was unaware of the subpoenas. Several current and former officials said the relationship between the White House and the FBI had been strained for months, in part because administration officials were pressuring Comey to more aggressively pursue leak investigations over disclosures that embarrassed the White House and raised questions about ties with Russia. That pressure was described as conversational challenges to FBI leadership to pursue the source of leaks seen as damaging to the administration, the officials said, speaking on the condition of anonymity to discuss internal deliberations. Although the FBI is investigating disclosures of classified information, the bureau has resisted calls to prioritize leak investigations over the Russia matter, or probe matters that did not involve leaks of classified or otherwise sensitive information, the officials said. “The administration has been putting pressure on the FBI to focus more on the leaks and weren’t satisfied with the results,’’ said a former senior U.S. official familiar with the matter. A current official said administration figures have been “very aggressive’’ in pressuring the FBI. Trump weighed firing his FBI director for more than a week. … He had grown enraged by the Russia investigation, two advisers said, frustrated by his inability to control the mushrooming narrative around Russia. He repeatedly asked aides why the Russia investigation wouldn’t disappear and demanded they speak out for him. He would sometimes scream at television clips about the probe, one adviser said. … Trump had grown angry with the Russia investigation — particularly Comey admitting in front of the Senate that the FBI was investigating his campaign — and that the FBI director wouldn’t support his claims that President Barack Obama had tapped his phones in Trump Tower. 9. Rosenstein’s memo allegedly followed a request to him from Comey for more resources to investigate Russia. According to the Times, four congressional officials, including Sen. Richard Durbin, said Comey told them that in a meeting in recent days, he had asked Rosenstein for “a significant increase in resources for the bureau’s investigation into Russia’s interference in the presidential election.” Rosenstein’s memo, dated May 9, doesn’t mention this request. To recap: The White House is lying. We know this because its explanations radically conflict with each other and with Trump’s past statements, leaked accounts from inside the administration, and other evidence from the past four months. Those statements, leaks, and other evidence point to a different explanation for Comey’s firing: the Russia investigation. In Trump’s letter to Comey, and in interviews and statements about the firing, the White House is trying to erase the investigation and declare Trump and his associates innocent. Instead, they have added a new level to the scandal: obstruction of justice. And the termination of James Comey is Exhibit A.